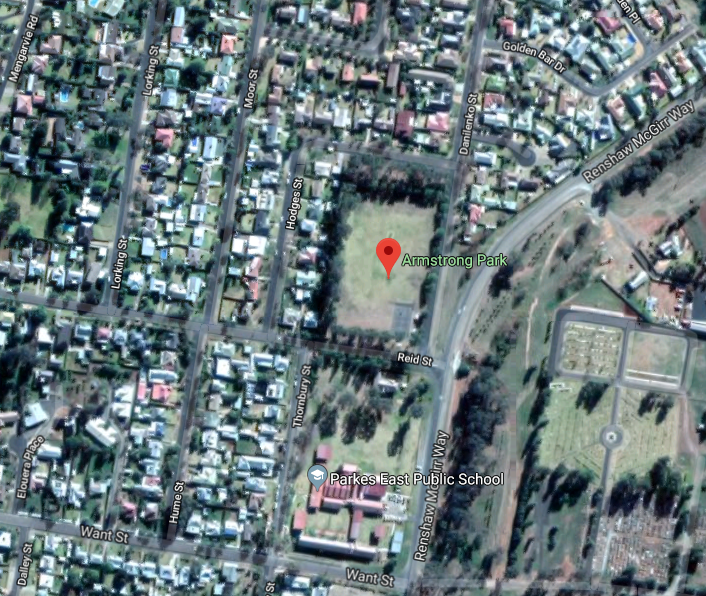 Nestled within the leafy, eastern side of Parkes, is a park that junior cricketers frequent on a Saturday. It also contains the only public basketball court in town. Originally known as “Reid Street Park”, it was renamed Armstrong Park to honour a former Alderman of Parkes. 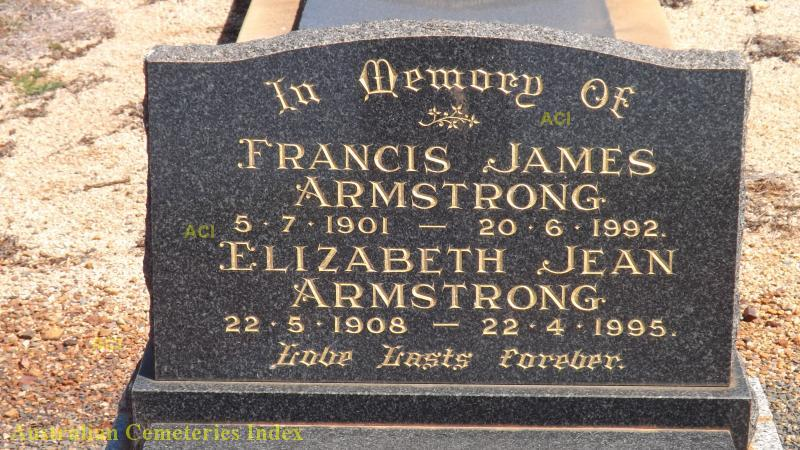 However Francis James “Frank” Armstrong was even more than a great servant of Parkes Municipal Council. He was an apiarist, builder, author and adventurer. His story is one of family, optimism in the face of whatever life throws his way and of bees! It is important to note here, that Armstrong Street IS NOT named after Frank Armstrong. It is mentioned on Trove in Western Champion Friday September 10, 1909, page 20 and Frank would have only been eight years old at the time – and yet to set foot in Parkes! Frank’s story starts in Temora – a town in the north-east of the Riverina area of New South Wales – and will also take in other country towns within NSW as well as Queensland and Western Australia. Eventually, Frank Armstrong settled down calling Parkes home for over 40 years. Armstrong’s tale has triumphs and tragedies, yet displays a resilience that defines the generation that came through the Great Depression and the Second World War. 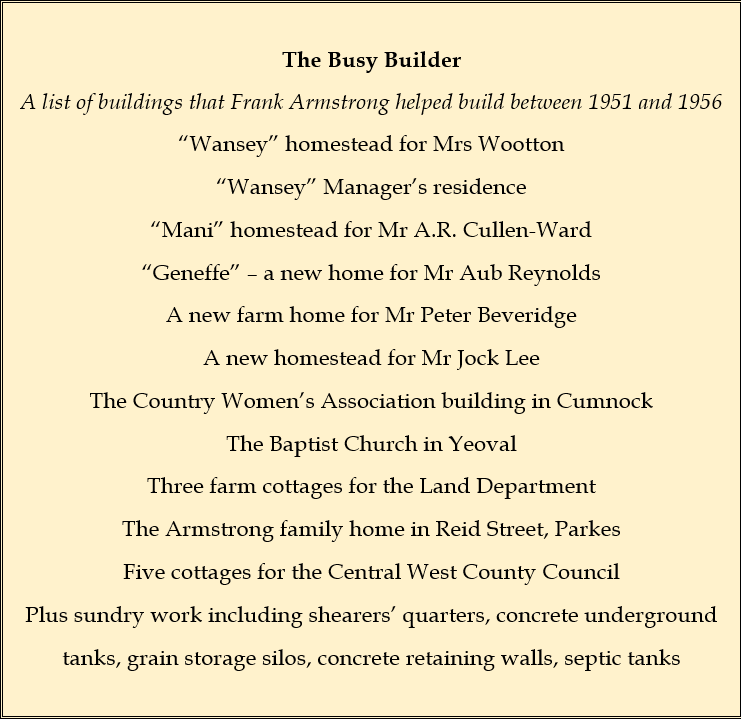 Researching Frank Armstrong is a pleasurable activity due to the fact that he wrote a book on his family’s history A Farmer’s Son Without A Farm. Finished in 1985, this book is part of Parkes Library’s Family & History Resource Room, having been presented to Parkes Library by the author on 7th April 1986. While providing an invaluable connection to yesteryear, it also highlights Armstrong’s affinity for bees. The author points out that several hives in his backyard were always within his sight while he was writing his book. My place of birth was on a farm four miles east of Temora NSW on the Stockinbingal Road….The farm house had Pise (rammed earth) walls and corrugated iron roof. It was a very humble home. In those times there were no palatial homes among the new settlers. My birthdate [sic] is the 5th July 1901, just six months after the federation of the states of Australia into the Commonwealth of Australia. Edmund Barton was the first Prime Minister. While I had nothing to do with Federation, I firmly believe it was long overdue. To think of Australians as different people because they lived in different parts of Australia is quite ridiculous. What greater folly can be imagined than building railway lines of different gauges, or having trade restrictions between the states. Frank was the eldest child of James Armstrong and Elizabeth Selmes – although to those who knew them they were ‘Jim’ and ‘Lila’. James Armstrong was born in Ballarat, Victoria and the family regarding his birth date as 25th November 1868. When Frank was researching his book his father’s birth certificate was obtained and it stated the date as 20th November. However since Jim and all his family always celebrated his birthday on the 25th, Frank has decided to keep it that way. While Frank could not recall in his book the exact reason why his father moved from Victoria to Temora, New South Wales, he suspects it was due to the desire to obtain some land of his own or perhaps the lure of alluvial gold which had been found in the area. James’ father – Frank’s paternal grandfather – was born in 1830 in Berwick-upon-Tweed. A carpenter by trade, when he arrived in Melbourne in 1851 he was caught up in the gold rush to Ballarat and later on became a gold mine manager. While Frank Armstrong’s story is an incredible one, there is probably one defining moment that caught national attention: when he decided to take 20 million bees across the country with his family in tow! At the time he was considered one of the country’s leading apiarists, but this endeavour granted him celebrity status! The following reports are just a few of the many national and state newspapers and magazines that covered the story, including a special feature in The Australian Women’s Weekly. Return to NSW – and a new home! 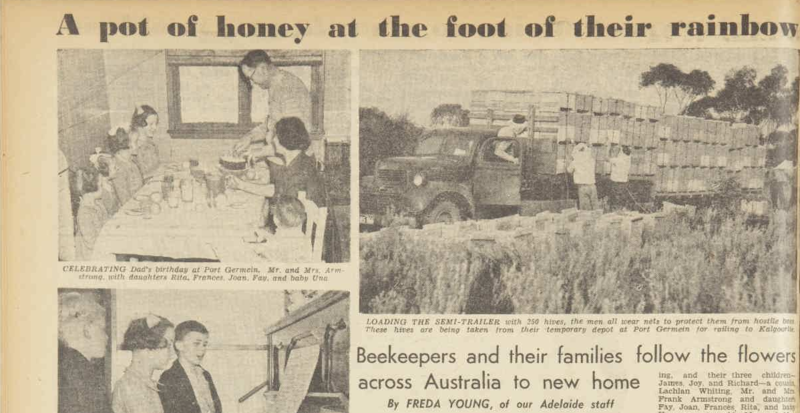 While Frank Armstrong had experienced success with honey production in Western Australia, being ever present of changes in the market, he could see that rising production costs would eat into any profits. This wasn’t taking into account how honey exports would change. While this was disappointing, it did lead Frank and Jean to make one of the best decisions – moving and settling in Parkes! The partial failure of the honey crop in the 1950-51 season, coupled with poor prospects for the next season had a very unsettling effect on me. To tide over to better times I thought seriously of entering the building trade in W.A. but on second thoughts it seemed wise, if that were to happen it would be better to be in N.S.W. where I had a good reputation, as a builder. We had no financial worry as our operations in W.A. had been a financial success and we were better off than we have ever been. It was the future prospects that did not look very promising. 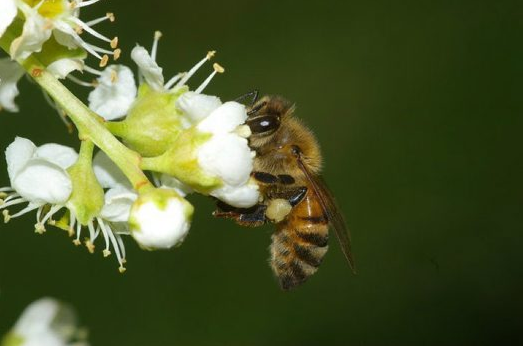 The export market for honey was not good and the cost of production was rising. 1951 was the year of the boom in wool prices and it was not long before wool growers were beginning to make investments in new homes and farm and station buildings. I make no secret of the fact that I was homesick. Jean was quite prepared to do what seemed to be best for our family. After agonising over the situation for several weeks we finally decided to return to N.S.W. and finally chose Parkes as a good town in which to make our future home. With benefit of hindsight we have never regretted that decision. Our first job after arrival at Parkes was to set up the caravans and to make them as comfortable as possible. This was done by parking them twelve feet apart and flooring the space in between. An iron roof was then built over this space including the vans. The rear end was closed in and the front end closed with windows and a door. To the people of Parkes it must have looked a very humble home. We did not worry much because we knew there were better things to come. For the time being we were comfortable, we had water and electricity connected. In 1956 Frank was elected to Parkes Municipal Council. In his book he recounts his thoughts on the matter. At the Municipal elections in December I was elected as an Alderman of the Parkes Council. At the first meeting of Council I was elected Deputy Mayor. The man elected Mayor was Cecil Moon, an Englishman who, at a very early age had been a member of the Australian Forces that landed at Gallipoli. I felt honoured to be his deputy. As I drove home that night I could not help thinking, that it was a far cry from the humble days of my boyhood. It also occurred to me that the small number of people who referred to us as Gipsies [sic] because we lived in Caravans when we first came to Parkes, would perhaps change their thinking, because by then we owned one of the best homes in Parkes, and [were] giving employment for quite a few of the town’s tradesmen. From a responsibility point of view it is doubtful if there was much difference. As an Alderman it was a duty to work for the good of the community in which I lived and as a youth it was my duty to work for and be loyal to my family. I discharged both responsibilities to the best of my ability. Now in my declining years both bring me a great peace of mind. Most accidents are caused by carelessness and this was no exception. My left thumb came in contact with the [circular] saw. There was no pain the saw just nocked [sic] my thumb away, but in the process it took out a piece of flesh only just smaller than a five cent piece. Neither the bone or the nail had been touched which was very lucky. I was taken promptly to the Casualty ward at the hospital. A young Doctor, named Dr Drake, examined my thumb and the detached piece. Well he said we will have a try at grafting it back where it came from. About three hours later the sewing process was completed, which only took a few minutes really. Being a carpenter, my left thumb is my favourite. You may wonder why carpenters have favourite thumbs. If you are right handed as I am just try picking up or holding nails without a left thumb! The personal story of Frank Armstrong highlights how kindness can be reciprocated in amazing ways. In the spring of 1974, Frank’s search for ideal breeding conditions for his bees saw him find the perfect spot in Enngonia – 100 km north of Bourke and only 40 km from the Queensland border (Sydney Morning Herald 2004). The school teacher at Enngonia Public School at the time, Robert Manwaring, was interested in bees. Friendly terms were developed between the Armstrongs and Manwarings with Frank and Jean invited to visit the school for a bee presentation. The interest from the school children resulted in most of the students and some of their parents visiting the Armstrong apiary for a first-hand demonstration of how to rear queen bees and how to extract honey. It was during these friendly encounters at Enngonia that Jean mentioned her five year trouble with her eyes including glaucoma and cataracts that had left her with only one good eye. Robert Manwaring, upon hearing of this, arranged an appointment with Jean at Bourke Hospital with a friend of his. This friend was none other than Professor Fred Hollows who advised that an operation at Prince of Wales Hospital in Randwick could restore the sight to her right eye. In 1977 Jean’s left eye developed a cataract and again Manwaring’s friend, Professor Hollows, treated Jean with equal success. Frank records that the Armstrong family hold Fred Hollows in the highest esteem, following with pride his increasing recognition internationally with all his work in ophthalmology. NOTE:The late Professor Fred Hollows has another link to the Parkes Shire. In July, 1971 he assisted Mum Shirl Smith, a prominent Wiradjuri woman, in establishing the Aboriginal Medical Service. Both Mum Shirl and Fred Hollows’s widow, Gabi Hollows, have been awarded Australian National Living Treasure status. building a new home for Herb and Rita at Vincentia on the South Coast of NSW in 1978. Herb and Rita were teachers, and the deal meant that Frank made no profit as only cost of labour and materials were paid for. Planned for three months, which was the maximum long service leave that Herb could take with NSW Education Department. The house took four months with Frank working solo for the final month. In 1979 Frank had a difficult decision to make. The Armstrong’s eldest grandson, Greg Page, had been employed in the building trade for 19 months without apprenticeship. Greg asked his grandfather to take him on as an apprentice. While overjoyed to not just see his grandson follow in his footsteps but play an active part, Frank had initial concerns. As he writes, “I was nearing 78 years, and it would take three years to see Greg through an apprenticeship.” (p.79) In the end Frank decided to take Greg on, and it ended with Greg passing his Building Trades course, with honours, at Forbes Technical College. A quick search on the Facebook page Parkes In Photos Of Years Gone Past reveals that people still remember Frank Armstrong as the “bee man”. This is not just because of the trip across Australia but because Frank so often had beehives that he was tending to. For many years, Frank also supplied honey and wax for the Parkes show as part of the District Exhibit. Frank gracefully allowed others to enter and win the honey competitions as he felt he had so many bees that he had an unfair advantage. However this blog has only partly covered his incredible story, and he was as busy as the bees he loved so much. Many homes still feature his handiwork, and one of the reasons that Parkes East is so leafy is due to Frank’s hard work as part of the East Parkes Progress Association. 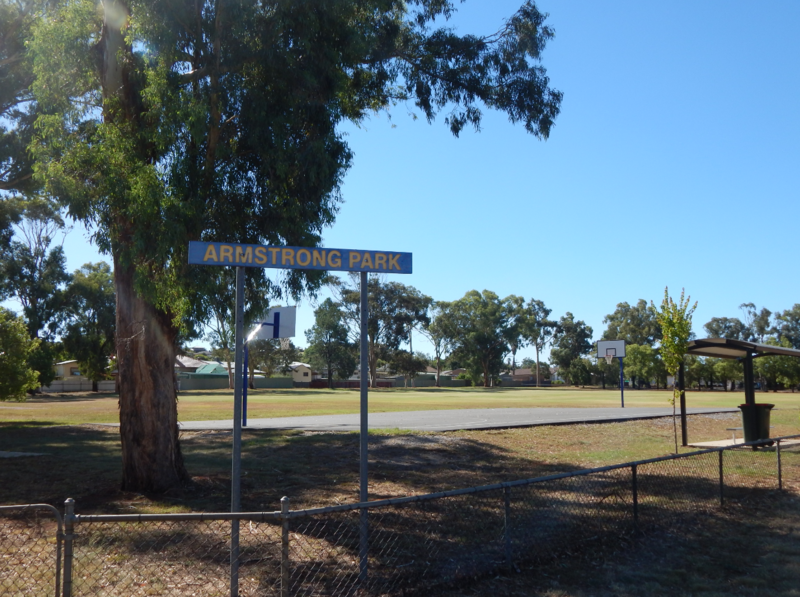 On 29th March 1965, Parkes Municipal Council named Reid Street Park, Armstrong Park. By writing his story, Frank Armstrong provides not just his family but all people valuable insights to life in Parkes in years gone past. It is also a tale of hard work, perseverance, family and of course, bees. 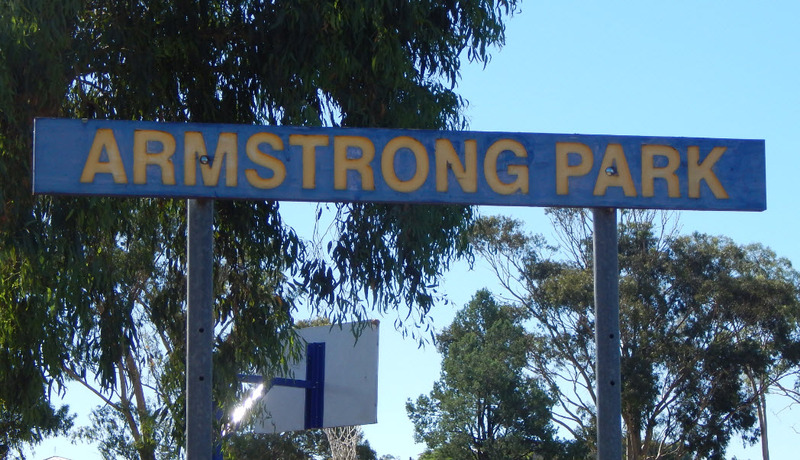 If you have stories of Armstrong Park, Armstrong Street or Frank Armstrong that you are willing to share please contact Parkes Shire Library via library@parkes.nsw.gov.au so that they can be shared and kept for posterity on this blog. Alternatively, you may leave comments on this page. District Beekeeper’s Trek Across Australia. (June 9, 1947). The Champion Post, p. 3. Tindall, R. T. (1983). 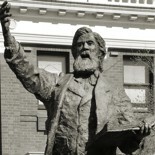 Parkes: One Hundred Years of Local Government. 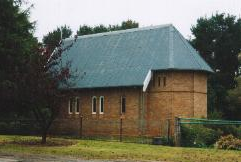 Parkes, N.S.W. : The Council of the Shire of Parkes. This entry was posted on August 29, 2018 by parkeslibrary in 1940s, 1950s, 1960s, 1970s, 1980s, 1990s, Across the Country with 20 Million Bees, Armstrong Park, Exporting Queen Bees, famous people of Parkes Shire, General history, Humble and Happy Beginnings, Legacy of Frank Armstrong, local historical articles, Parkes, Parkes Library Family & Local History Resources, parks, Return to NSW - and a new home!, The Busy Builder, The Late Seventies And Still Busy, Uncategorized, Wiradjuri and tagged 20 million bees, 25 Mengarvie Road, 27 Mengarvie Road, A Farmer's Son Without A Farm, Alderman Armstrong, alderman of Parkes, Allan Eggleston, apiarist, apiary, apis mellifera, apprenticeship, Armstrong Park, Asia Honey Bee Company, Australian Women's Weekly, Back Yamma Road, Balranald, basketball, basketball court, bee man, beekeeping, bees, Bill Page, Bill Pavey, Bob Eggleston, Bourke Hospital, builder, Cecil Moon, Central West County Council, Clarinda Street, Commercial Apiarists Association, Country Women's Association, Cowra, cricket, cricket field, Cumnock, Cumnock CWA, Dan Fredericks, Department of Information, Dr Drake, east Parkes, Edmund Barton, Elizabeth Jean Armstrong, Elizabeth Jean Eggleston, Elizabeth Selmes, Engonnia, Engonnia Public School, family history, Fay Page, Federation, Forbes Technical College, Francis Armstrong, Francis James Armstrong, Frank Armstrong, Fred Morris, Gabi Hollows, Geneffe, Greg Page, Herb and Rita, honey, honey bee, Iran, James Armstrong, Jean Armstrong, Jill Crisp, Kalgoorlie, Legacy of Frank Armstrong, Leo Vaughan, Mackay Queensland, Mani, Mani homestead, Mayor Alderman A C Moon, Mazoudier Building, Mengarvie Road, Michael Minogue, Mr A R Cullen-Ward, Mr Aub Reynolds, Mr Jock Lee, Mr L G Brown, Mr L Sharah, Mr Peter Beveridge, Mrs Wootton, Mum Shirl, Mum Shirl Smith, Norm McDonald, NSW Department of Education, ophthalmology, Parkes, Parkes East, Parkes East Progress Association, Parkes East Public School, Parkes In Photos of Years Gone Past, Parkes Municipal Council, Parkes Shire Library, Parkes Show, Prince of Wales Hospital Randwick, Professor Fred Hollows, queen bees, Reid Street, Reid Street Park, Reid Street Parkes, Richard Crisp, Robert Manwaring, Ron Tindall, St Matthews Anglican Church Cumnock, Stockinbingal Road, Tehran Iran, Temora, Thornbury Street, Thornbury Street Parkes, Vincentia, Wansey, Wansey homestead, Warren Jones, Wellington Road, Yeoval Baptist Church.